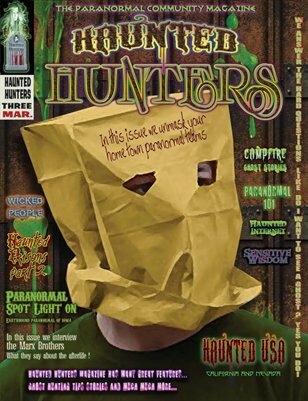 In this issue we will delve into the mind of another Something Wicked This Way Comes with infamous gangster Roy DeMeo as well as bringing to you part 2 of the most haunted prisons. For the first time we bring to you some spooky stories, Campfire Ghost Stories, you can share with your friend over the campfire this summer! We are proud to welcome Earthbound Paranormal of Iowa in our Paranormal Spotlight with their feature investigation of the Farrar Elementary School. This team shows what lengths paranormal investigators should go to ensure all of their clients needs are met! Looking for a place to investigate in your state? This issue we bring to you Haunted Nevada and California. These articles will serve as your guide to locating and contacting the owners of the states most famous and ghost filled haunts. Looking for some light hearted fun talking to spirits long departed? Check in on Monster Mac’s Interviews From The Afterlife as he “sits” down with the Marx Brothers.